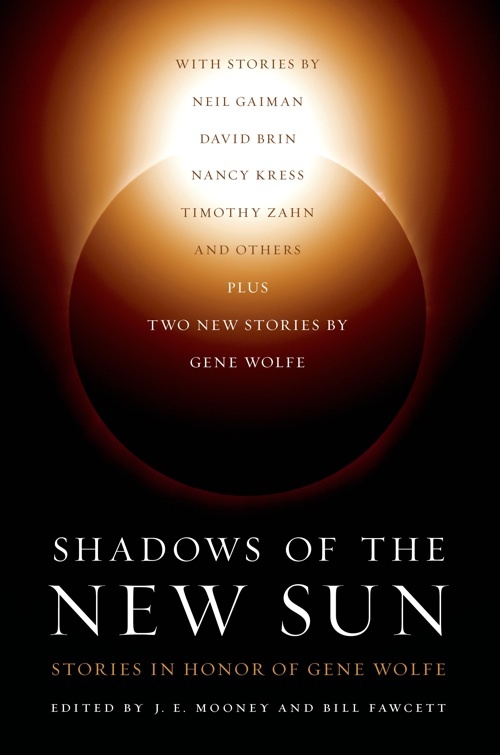 Shadows of the New Sun is a new anthology honouring Gene Wolfe to be published by Tor this August. The anthology features stories by Gene, Neil Gaiman, Nancy Kress, David Brin, and more. The foreword is now available to read online at the Tor Website. Foreword copyright ˝ 2013 by Jean Rabe. “Frostfree” copyright ˝ 2013 by Gene Wolfe. “A Lunar Labyrinth” copyright ˝ 2013 by Neil Gaiman. “The Island of the Death Doctor” copyright ˝ 2013 by Joe Haldeman. “A Touch of Rosemary” copyright ˝ 2013 by Timothy Zahn. “Ashes” copyright ˝ 2013 by Steven Savile. “Bedding” copyright ˝ 2013 by David Drake. “. . . And Other Stories” copyright ˝ 2013 by Nancy Kress. “The Island of Time” copyright ˝ 2013 by Jack Dann. “The She-Wolf’s Hidden Grin” copyright ˝ 2013 by Michael Swanwick. “Snowchild” copyright ˝ 2013 by Michael A. Stackpole. “Tourist Trap” copyright ˝ 2013 by Mike Resnick and Barry Malzberg. “Epistoleros” copyright ˝ 2013 by Aaron Allston. “Rhubarb and Beets” copyright ˝ 2013 by Todd McCaff rey. “Tunes from Limbo, But I Digress” copyright ˝ 2013 by Judi Rohrig. “In the Shadow of the Gate” copyright ˝ 2013 by William C. Dietz. “Soldier of Mercy” copyright ˝ 2013 by Marc Aramini. “The Dreams of the Sea” copyright ˝ 2013 by Jody Lynn Nye. “The Logs” copyright ˝ 2013 by David Brin. “Sea of Memory” copyright ˝ 2013 by Gene Wolfe.